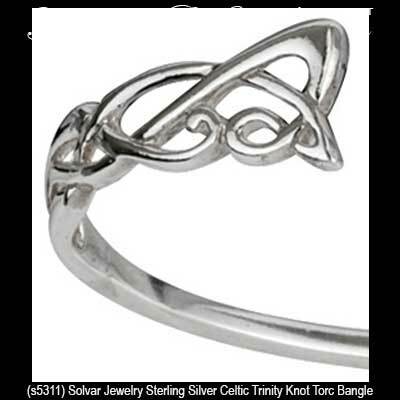 Sterling silver Celtic bangle is a torc style bracelet that features a stylized Trinity knot at each end. This sterling silver Celtic bangle bracelet features a filigree Trinity knot at each end and it measures 3/8" tall at the widest point. The Celtic torc bangle is suitable for most women's wrists and it is made in Dublin, Ireland by Solvar Jewelry. The Trinity bracelet is gift boxed with a Celtic knot history card, complements of The Irish Gift House. Sterling silver Celtic bracelet is a hinged bangle that features a Trinity knot in the center. Sterling silver Celtic bracelet is a torc style bangle that features fancy filigree Trinity knots at each end.